The details: Season seven was called the show’s rebound season (even we uber-devoted 24 fans would probably have to admit season six wasn’t the series’ best), as it provided Jack Bauer-led thrills from beginning – Jack on trial! – to end. Okay, not spoiling the end, but suffice it to say that season seven wound up with a cliffhanger and more than one former CTU-er watching his or her life spiral out of control … and it all looks even better on Blu-ray. The extras: Deleted scenes, 24: The Untold Story featurette and episode commentary by stars Carlos Bernard, Annie Wersching, James Morrison, Jeffrey Nordling, Mary Lynn Rajskub and Glenn Morshower. The details: Worth the price of re-buying the DVDs just for the chance to see the pilot episode – the best pilot in TV history, IMHO – remastered for hi-def. The extras: Audio commentaries, cast auditions, Welcome to Oahu: The Making of the Pilot, deleted scenes, bloopers, and featurettes on Vincent the dog and The World According to Sawyer. The details: All 43 episodes of the classic – okay, classically cheesy – Sid & Marty Krofft kiddie show. The extras: It comes packaged in a very detailed, full-color metal lunchbox. Seriously, the lunchbox is so cool, you’ll want to borrow it from dad, pack a PB&J and Capri Sun and head back to third grade. 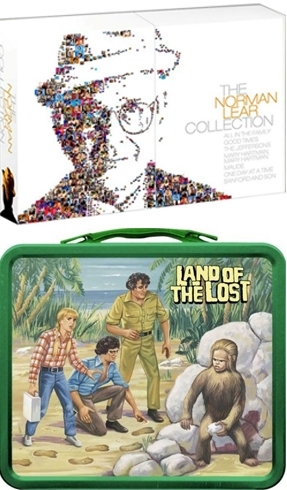 The details: Great collector’s set showcasing one of the most influential producers in TV history, Norman Lear, as evidenced by the complete first seasons of Lear’s hits Maude, All in the Family, Sanford & Son, The Jeffersons, Good Times, One Day at a Time and Mary Hartman, Mary Hartman. The extras: Here’s the real reason to buy the set: It includes more than six hours of new bonus features, including interviews with Lear, Rob Reiner, Bea Arthur, Jimmie Walker, Bonnie Franklin, Mackenzie Phillips, Louise Lasser and Rue McClanahan, two previously unseen pilots for All in the Family and featurettes like And Then There’s Maude: Television’s First Feminist, Everybody Loves a Clown: Sanford and Son, This is It: The Story of One Day At A Time and Movin’ On Up: The Jeffersons. The details: No one wanted to see it end, but the fantastic cop drama wrapped up with a satisfying, and sometimes heartbreaking, last season, in which Vic and partner in crime and crime-fighting, Shane, pay the price for their many misdeeds. The extras: Audio commentary on each episode, deleted scenes and featurettes on the making of the final episode and the final season. The details: There’s nothing horrible about this musical gem – produced by Buffy creator Joss Whedon during the 2008 Hollywood writers strike – which finds Billy, a.k.a. Dr. Horrible (Neil Patrick Harris), trying and repeatedly failing to become the supervillain he dreams of being. And, even when he’s trying to be a baddie, who doesn’t love NPH? The extras: More than 90 minutes worth, including commentary with Whedon, Harris and co-star Nathan Fillion, three Easter eggs, video applications from fans who wanted to join the Evil League of Evil and Commentary! The Musical, in which the stars sing about the writers strike and each other. The details: You love the Griffin clan, and you’re just as likely to love these equally naughty, uncensored cartoon works from Family Guy creator Seth MacFarlane. Not to be missed: A spoof involving Wile E. Coyote. The extras: Photo galleries and the ‘toon’s red carpet premiere, plus uncensored versions of all the animated shorts that originally appeared on SethComedy.com. The details: Schedule changes, a late midseason return and airing opposite American Idol all but insured Reaper would bite the dust after its second season, but it went out on a high note, with Sam (Bret Harrison), Ben (Rick Gonzalez), Andi (Missy Peregrym) and, of course, scene stealer Sock (Tyler Labine) embarking on their wickedly funny adventures while helping Sam do the Devil’s (Ray Wise) bidding. The extras: A gag reel, deleted scenes and the featurette The Devil Made Me Do It – A Look Back at the Making of Reaper. The details: The teens have their Twilight, but this Alan Ball-created vampire tale is for grown-ups, with Anna Paquin as small-town waitress Sookie Stackhouse, who can hear other people’s thoughts and falls for a 173-year-old vampire. Good times. The extras: A cheeky mockumentary about vampires in America, fake ads for Tru Blood beverages and audio commentaries from the cast and Six Feet Under creator Ball. The details: Nancy’s life continued to spin out of control after she burned down her house and moved the fam to a beach town near Mexico. That, of course, only provided her with new opportunities for her drug business, and even more dangerous opportunities to get mixed up with the wrong, murderous dudes. At least there was reliable comic relief from Nancy’s brother-in-law Andy (Justin Kirk), who realized he has some new feelings for his dead brother’s wife. The extras: Gag reel, trivia tracks, audio commentary and a featurette on “Uncle AWOL,” Andy Botwin. Plus, the “green” packaging is made of post-consumer recycled paper and plastic water bottles. The details: He’s the gangsta rapper fo’ shizzle, but he’s also a father of three and husband to wife Shante (who often wears the pants in the family). The DVD contains eight of the E! reality show’s best episodes. The extras: A Snoop dictionary quiz and a look at all his pimped-out rides.